Halle Langhi (22) punches the ball past McCracken County blockers in the first set of their home game against the Lady Mustangs. Marshall County is still looking for that first win over McCracken County, now in their sixth season and still holding a flawless record over their Region I opponents. The Lady Mustangs won Thursday in Draffenville 25-14, 25-17, 25-14 in their fifth game this season against a Region I team. In set one, the Lady Marshals led or were tied with McCracken County several times until down 11-10, the Lady Mustangs went on a 14-3 run to finish out the set to win 25-14, getting the final point on a kill by Makenzie Mason. The Lady Marshals stayed within two to four points in set two, then trailing 19-16, scored just one more point going on to fall 25-17. 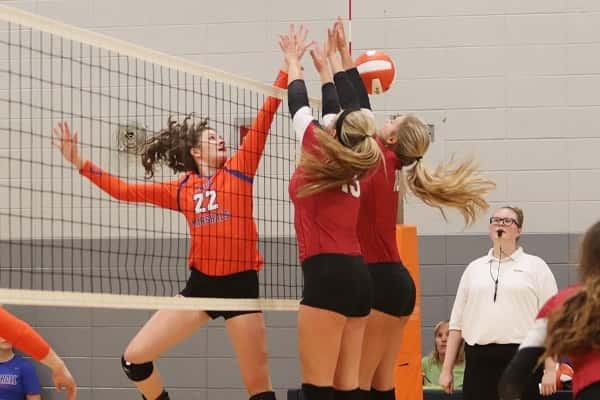 The third set was much like the second with the Lady Marshals hanging in until trailing 14-12 when McCracken County finished out the second half of the set, out-scoring them 11-2 for the three set win. Halle Langhi led the team in kills with 11, defensively McKenzie Elkins came up with 11 digs and Jessica Hicks with seven and leading in assists was Sarah Bradley with 12. The Lady Marshals are 8-8 while the Lady Mustangs improve to 11-7. 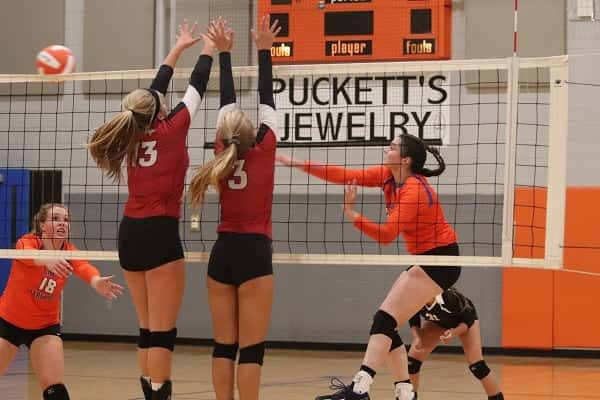 Jessica Hicks attempts to avoid McCracken County blockers Gracie Murt (13) and Aubrey Thomas (3).